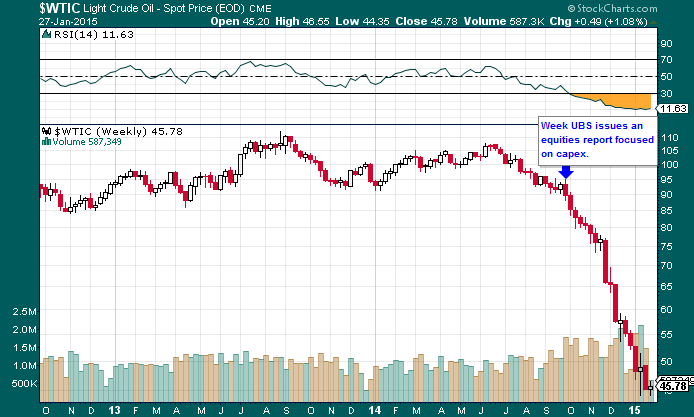 Almost nobody saw the crash in oil coming. A handful of savvy investors and analysts shared this thesis but were largely ignored. For all intents and purposes, “nobody” foresaw the action in oil which is the essence of the dumb crowd missing it again. Not inferring that I am not an occasional member of that dumb crowd, just commenting on the oil industry. When oil prices dropped, the instant message that was and continues to be bellowed across the financial landscape is that the drop would provide a pseudo-tax cut for the great unwashed in the form of lower gasoline prices. Along this line of thought is that the commoners will spread this saved gas money throughout the economy in various outlets. This should in turn support GDP levels, which is of course fallacious. Through Q3 of 2014, the US is annualizing 5% GDP growth. WHOOOOO! Gonna get some cold cuts based on that level of growth! The problem with the thesis that lower gasoline prices should support or maybe even boost GDP levels discounts two very important factors to the economy. Number one, nobody can predict the level of the money saved from lower gasoline prices that will go into personal savings. Number two and more importantly, the importance of the oil industry to national employment and economic growth has been totally discounted by far too many educated parties. Just look at how important the oil industry has been to America’s employment recovery. Now add in North Dakota and it’s growth in employment thanks to the Bakken. Last month the Joint Economic Committee provided an update courtesy of the BLS. Since February of 2010, the national low point in private sector employment, North Dakota added 102,500 private sector jobs. 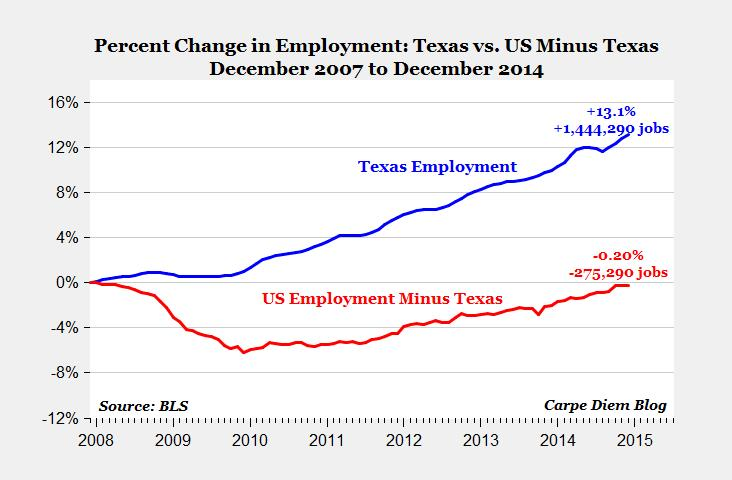 A vast majority of those went to petroleum related companies, making the “US Employment Minus Texas” numbers look even worse. Maybe you’re one of those thinking in your head with a Patrick the starfish voice, “Yeah, but a percentage of that job growth for Texas and N. Dakota is dedicated to non-oil like teaching, retailing, food services, etc.” Sure there’s growth in those areas too but an overwhelming majority of the growth has come in industries like mining, logging, transportation, utilities, and construction; where the pay has been significantly higher on average than in the non-oil industries. An argument could even be made that a high percentage of the growth in non-petroleum based jobs was simply derivative growth from the petroleum industry. Well what’s the point? There are a couple of points, actually. Talking to one’s self consistently is a strong precursor to madness, so at least I’ve got that going for me…which is nice. Seriously though, one of my points is where does the job growth come from in America now that the oil patch growth and development has fallen off of a cliff? Amazon DC part-timers? Wal-Mart part-timers? McDonald’s part-timers? Maybe I’m failing to notice a forest through some trees here but I’m having a hard time seeing the downward trend in unemployment continue its happy descent into “full employment.” And for the 1 plus 1 crowd, if there’s less people employed then there’s less people to buy things. Maybe there will be enough growth across all the other non-oil and gas industries, but that chart up above sure says a lot about placing too much faith in that thesis. The second point, which may be even more relevant, is where will the growth in US corporate capital expenditures now occur? It’s very late in this business cycle coming out of the Great Recession and capex output is still relatively weak compared to previous cycle recoveries at the same stage. Capex has been essentially carried by energy. Let’s look at some facts regarding US capex and the oil industry. Energy(primarily oil and gas) accounts for approximately a third of all capex in the S&P 500. That means it’s virtually irreplaceable. Need a visual? No problem. So if I’m understanding the basic tenets of the TV economists’ argument, US GDP will be just fine despite the oil industry tightening their belts because American consumers will use all that money they saved at the gas pumps at their favorite retailer, service provider, or online. BOOM! Problem solved. I just can’t reconcile that thesis with the facts as they are presented via the press releases of major oil companies. ConocoPhillips has already announced it’s slashing its capex budget by 20% for 2015, which means $3 billion less than 2014. Suncor, Canada’s largest company by revenue, is slashing it’s capex budget by $1 billion dollars for 2015 while also cutting operating expenses by up to $800 million in addition to a 1,000 person reduction in the workforce. Conoco did not announce layoffs in their presser regarding capex but you can be sure there will be layoffs there and across the board. We have yet to hear from the two giant US elephants of petroleum energy, Exxon and Chevron. Analysts are essentially expecting an average decrease of 25% in investment spending by energy companies. Let’s just see how the timing of that report’s issue coincides with the fall in the price of West Texas Intermediate Crude. Does 7.8% growth in 2015 capex sound credible now? Well done UBS Wealth Management. Positive guidance on capex right before capex is about to be gutted via a 50% slide in the oil price. Let’s do some basic, rough arithmetic based on the Deutsche Bank chart up above. Thirty-two percent of $685 billion is $220 billion. Twenty-five percent of $220 billion is $55 billion. So approximately $55 billion of what was to be potentially spent in 2015 is going to be eliminated and yet employment or GDP should be unaffected as the economy is recovering in the US. That’ll be what gets sold by the main stream media. Oil and gas notwithstanding, the capital expenditure reports coming out of the Federal Reserve branches were laughable. It’s all IT spending. Go read the December 3rd, 2014 Beige Book to see for yourself. Here’s an exercise for those who refuse to read the sleep-inducing report. Click that Beige Book link and search(hit ctrl-F) the document for “capital expenditure” and simply read the surrounding text. It’s mostly IT. I’m pretty sure that network upgrades and addressing cyber security concerns aren’t going to carry the US economy in conjunction with consumer spending, but we’ll have to wait for 2015 to play out. The bottom line is that 2015 is going to be a most interesting year for the US economy and the rest of the world for that matter, too. Just look at the volatility we’ve already seen across currencies, central banking behaviors, geopolitics, etc. I’m still seeing plenty of rosy projections for the US economy, coming off that 5% read, and maybe I just need somebody to crack me in the head to help me see the data in a better light.